Foreword by Daisy Goodwin The official companion to ITV’s hotly anticipated new drama, Victoria delves into the private writings of the young Queen Victoria, painting a vivid picture of the personal life of one of England’s greatest monarchs. From the producers of Poldark and Endeavour, ITV’s Victoria follows the early years of the young queen’s reign, based closely on Victoria’s own letters and journals. Now explore this extensive collection in greater depth, and discover who Victoria really was behind her upright public persona. At only eighteen years old, Victoria ascended the throne as a rebellious teenager and gradually grew to become one of the most memorable, unshakeable and powerful women in history. The extensive writings she left behind document this personal journey and show how she triumphed over scandal and corruption. 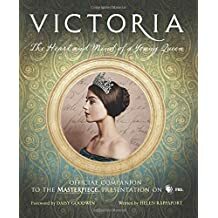 Written by author and Victoria historical consultant, Helen Rappaport, and including a foreword by Daisy Goodwin—acclaimed novelist and scriptwriter of the series—Victoria details the history behind the show. Revealing Victoria’s own thoughts about the love interests, family dramas and court scandals during her early reign, it also delves into the running of the royal household, the upstairs-downstairs relationships, and what it was like to live in Victorian England. Full of beautiful photography from the series and genuine imagery from the era, Victoria takes you behind the palace doors and discover the girl behind the queen.